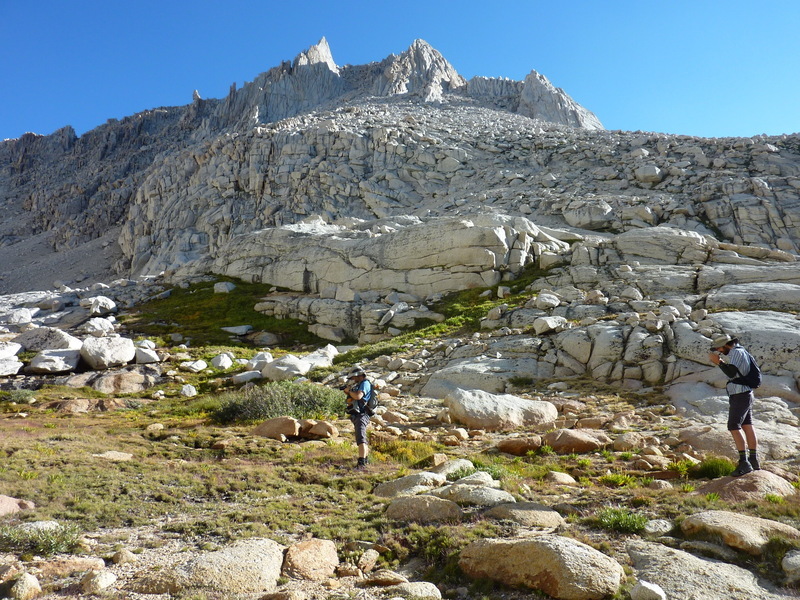 On the 8th day of the Sierra Challenge we were heading to unofficially named Gamblers Special, a summit in the Whitney area only 40ft shy of 13,000ft. Its unusual name derives from the nickname for the DC3 that regularly flew between Burbank and Hawthorne, NV in the 1960s, ferrying California gamblers to the casinos at Hawthorne where one could get airfare, dinner, a show and 7hrs of gambling for a mere $10. In Feb of 1969 the plane went missing, setting off a massive search that initially found nothing. It was presumed that the plane hit a mountain somewhere in route and all were killed. It wasn't until that summer that the wreckage was located under the melting snows that lay just north of the summit in a high cirque. The bodies were all recovered but some of the wreckage and many of the personal effects are still scattered among the ice, snow and rocks. Our route would start on the Whitney Trail, turn right up the North Fork trail to Little Boy Scout Lake, and then head cross-country north to the summit. I had originally believe that the route would skirt the Whitney Zone for which day use permits are required, but it was brought to my attention the day before that it did indeed go through a slice of the zone. My hope was that it was a corner of the zone that would be unlikely to be patrolled, leaving us to slightly flaunt the law in peace. At less than 10mi roundtrip, it would easily be the shortest of this year's Challenge peaks. We had nine at the Whitney TH for a 6a start, most of them the usual six suspects who had made it to the Challenge summits on the previous seven days. The Forest Service has done an excellent job of making an almost regular trail out of what used to be a somewhat confusing, threaded series of use trails running up the North Fork of Lone Pine Creek on both sides and through the E.B. Ledges. The ledges in particular have been tamed with large cairns marking the route at the key locations where folks were apt to get off-route in times past. We reached the placid waters of Lower Boy Scout Lake at the base of Thor Peak in an hour and a quarter. From here we turned north and climbed easy but steep slopes into the Carillon Creek drainage found in a high meadow area above. The headwaters of the creek are found in a SE-facing cirque between Carillon, Cleaver, and Gamblers Special. We followed this drainage upwards for some distance until we were on the southwest side of our peak. I had no clear picture of the best way to climb the peak and had intially assumed we'd climb higher into the cirque before climbing to the saddle with Cleaver Peak. But as others started up the SW side on what looked like an obvious route, I simply followed suit. The slope led to a broad chute between what looked like two possible summit candidates from below. Neither turned out to be the highpoint. Rather than having to decide which way to turn, we simply continued upwards past both points. It took just under three hours to reach the summit. To ward off the cold breeze at the summit we donned jackets and hats while trying to stay out of the wind to wait for the others. A register found at the highpoint was placed by Gordan & Barbara in 1978. Paper scraps dated even further back, to 1972 where mention is made of Smatko's first ascent party in 1965. Besides the scraps, the register held 15 pages of entries, most often by OPG notables Bob Rockwell, Bob Joy, Tom Brown and a few other recognizable names. All told, the summit averages less than one party per year. Though we had seven at one point and ten participants total to reach the summit, ours was only the second largest summit party, bested by a group of 11 in 2008. Without knowing exactly where the crash site was, I had little expectation of seeing it from the summit when I started peering over the northern edge. To my surprise, I spotted it almost immediately high in the cirque on that side of the mountain. In this drought year there was no snow remaining to hide the wreckage, but rockfall over the past decades have covered much of what remained. Still, there were twisted pieces of the aluminum skin and other debris that could be readily seen some 1,200ft below. Getting down to the wreckage appears to be a fairly straightforward task of descending the East Ridge until one can drop north into the cirque, but it would take up much of the remaining day to do so and get back. None of us were that curious to invest the time and effort. After collecting seven of us at the summit we took a group photo and started down, chosing a more direct route down the SE Face of the mountain with almost 2,000ft worth of sand and talus. The loose slopes would make for a tedious ascent (as attested by one of the register entries), but made the descent far quicker than it would have been going back down the SW side, taking but 20 minutes from summit to Carillon Creek. Eric, Nick and I traveled together back down the E.B. Ledges and the North Fork trail. Once back at the Whitney Trail I took them down the old trail that starts west of the Portal Store at the bend in the road. We were back by 11:15a, the only finish before noon this year - really too early. Back in Lone Pine, I grew restless in the afternoon with so much time on my hands and set out to explore the Alabama Hills some. This famous movie set for so many westerns in the mid part of the 20th century is now a haven for rock climbers when weather in the backcountry is less inviting. I picked out a few of the more prominent summits to make short hikes to, both found not far from Movie Road, a good dirt road that any vehicle can navigate to explore the area. Mine was only one of a number of cars that were plying the dusty road on a hot Friday afternoon, though I think I was the only fool enough to get out and hike in the heat. Near the top of what I believed to be the Alabama Hills HP I came across two vultures snacking on the entrails of a less fortunate creature. One flew off immediately, the other following suit a minute later when it judged I was not going away. They were probably relieved to come back later and find I had not disturbed their meal. The two summits offered only hazy views, not particularly good today. I imagine the views in wintertime are another story, with clear air and the Sierra blanketed in winter white. My exploring covered less than two miles on foot, but gave me something to do for a few hours before meeting up with the others for pizza at 5pm. I didn't dare try to include these as bonus peaks on the stat sheet lest I open myself up for (deserved) abuse from the others. A few participants that had reached LBSL shortly after the main group were met by a USFS ranger who had spent the night at the lake and was on his way down. When asked where they were heading to, they showed him the map I had prepared showing the route to Gamblers Special. They were informed that they would be violating the Whitney Zone for which they had no permit and told them if he didn't see them back at the Whitney TH a short while later they would be issued a citation. Further, he proceeded to write down the names of all the participants who were listed on the other side, presumably to issue citations to those that had gone up earlier. And then he left, heading down the trail. Only one of the hapless crew failed to heed the warning, choosing to continue to the summit despite a possible fine worth hundreds of dollars. I have to admit I admire his gumption. As far as I know, no citations were ever issued.